The holiday season is fast approaching, so I thought I’d pick out some favorite necklaces for consideration as gift ideas. It’s no secret that I rather fancy our nature-inspired pieces, but there are many who would really love a floral pendant such as this one. The simple style of the blossom is radiant and the petals themselves are perfect in the way that they shimmer and reflect light. This pendant is one of the newest additions to our site and is seen above with a morganite gemstone as well as a smaller diamond sitting atop it. The piece actually comes with a number of different types of gemstones as the second larger stone, but there is something particularly sweet about the rendition with a morganite. If this peachy pink stone isn’t for you though, the piece can come with an aquamarine, black diamond, sapphire, ruby, emerald, or white diamond. 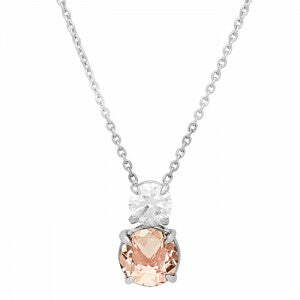 Morganite engagement rings are among our most popular style of engagement ring, so a great follow up gift to someone who has a morganite ring already is to give them a morganite solitaire pendant. Fashioned entirely from rose gold, the pieces beautifully complement the pinkish hues of the stone. I hope this selection of product favorites helps you in your choice this holiday season for jewelry to pick up. 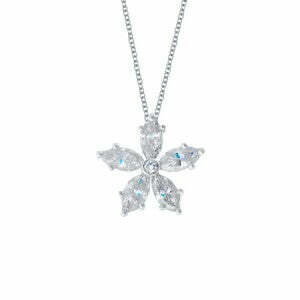 We have much more where that came from, so please feel free to look through our entire selection of necklaces.